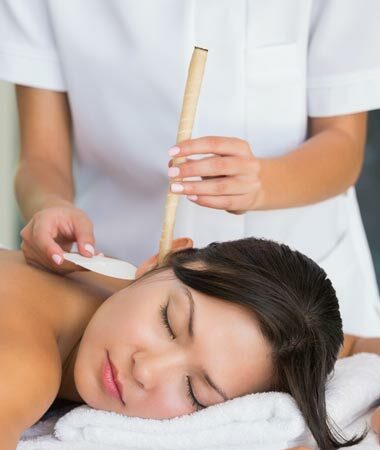 Ear candling is a very safe and non-invasive treatment. A Hopi Ear Candle is a hollow cotton tube impregnated with therapeutic oils, beeswax and honey. The candle is painlessly inserted into the ear and when lit helps to draw out impurities and relieve pressure in the head and sinuses. An ear candling session begins with the client lying comfortably on their side on the therapy couch. The Hopi Candle is gently inserted at the ear entrance, lit and held securely. While the candle burns there is very gentle, soothing, crackling, hissing sound and a sensation of gentle warmth around the ear and head. Some clients experience a feeling of pressure being released in the ears and sinuses. The candle takes around 8-10 minutes to burn down, it’s then removed and the area around the ear is massaged. The whole procedure is repeated on the other side. The ear candling treatment finishes with a short relaxing sinus drain massage of the face, neck and head. As well as relieving discomfort and problematic symptoms, ear candling can also have a positive effect on emotional, mental and spiritual well-being. It’s a deeply relaxing treatment and can ease anxiety and nervousness, leaving you feeling happier, lighter and calmer. "Oceanus Clinic is immaculate and very calming and Collette's energy is very soothing. Added bonus there's lots of parking and it's free! Highly Recommend! "Had my first medical pedicure today! Fantastic! My feet felt and looked great once done. I'll definitely have more." "After my session I definitely felt clearer and a bit lighter in weight. Thank you Collette. I know I am in good hands and highly recommend getting a colonic session with Collette." "A beautifully decorated clinic, modern and clean. Had the ear candling done, which worked brilliantly. Collette is so helpful....I'll be back again." Collette is just lovely and really puts you at. Been a number of times over the last few years and would highly recommend and will be back soon! "Loving my new and improved feet! Thank you." "First podiatry pedicure and it was absolutely first class Collette ! Feel like walking on air !" Big thank you to Colette for my dermaplaning treatment today. First time having this treatment but I felt really at ease with Colette and I am really pleased with the results.